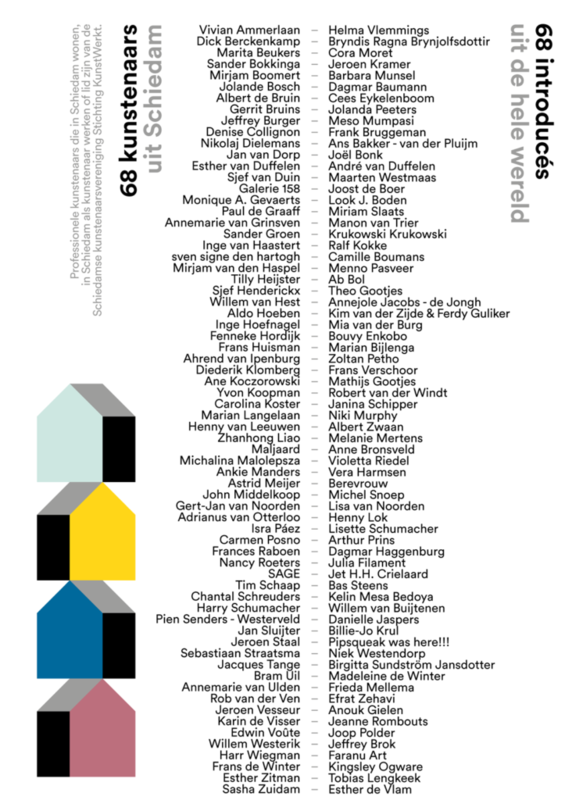 68 Schiedamse kunstenaars en hun 68 introducés. Niek Hendrix, Machteld Solinger, Aimee Terburg, Fabian Westphal Just Quist, Vincent Uilenbroek, Flo van der Waa, Roel Jeroen van der Linden, Paul de Jong, Wilma Vissers, Kathleen Huys, Els Vekeman, Kenan Hasimbegovic, Tobias Lengkeek, Ritsart Gobyn, Kris Fierens, Udona Boerema. Harm van den Dorpel, Peggy Franck, Katja Mater, Jacco Olivier tonen, Thijs van Geloven, Thom Brand, Dieuwke Eggink, Jonathan Hurry, Wouter van der Laan, Tobias Lengkeek, Romee van Oers en Esmee Seebregts. Nastia Cistakova, Puck Schot, Willehad Eilers, Anna Mala, Tim Badoux, Gilles de Brock & Mike Kokken, Rudy Simon, Tobias Lengkeek, Martin Gabriel en Father Futureback. Candela Bado, Zeno Beikircher, Yair Callender, Daniel Dmyszewicz, duo Frederik en Jakob, Doris Hardeman, Josje Hattink, Bas Kaufmann, duo Koolen en van de Lande, Tobias Lengkeek, Leslie Nagel, Jeannette Slütter, Marnix van Uum and Victor Yudaev. Andrea Freckmann, Tobias Lengkeek, Ronald Versloot. firma van drie / De mens in het wild, Gouda. The paintings I make show that the world around us is full of meaning. Like Malevich and Mondriaan were looking for shapes full of meaning, I am looking for moments full of meaning. We understand images on a visual level, we see what it is being represented. However we don’t know the context of the image, they lack conclusions. We’re always left wondering why this is represented and think of a possible explanation. In the end we can only make suggestions, never coming to a definite conclusion. It is at that moment that we have to accept what we see. We feel that every day things hold a higher meaning beyond ourselves and realise that even though our eyes are open, we don’t always truly see the things around us. Looking at the world with an open mind and seeing what others passed by, things left unnoticed. Special things are always around us. Each place is unique in its own way. Every moment only happens once. Memories always seem different than the actual moment an event took place. Expectations can make us look differently at things. Others can make us see what we missed. Mediavormgever, Grafische vormgeving Deltion College.